Mississippi Soybean Promotion Board is made up of 12 farmer-leaders who oversee the investments of the soy checkoff on behalf of all Mississippi soybean farmers. These volunteers work to increase soybean farmer profitability by investing checkoff dollars in ongoing public research and extension programs that address Mississippi production challenges, and driving the adoption of best management practices developed through research and ensuring the sustainability of Mississippi soybean production. The soy checkoff is supported entirely by soybean farmers with individual contributions of 0.5 percent of the market price per bushel sold each season. Fifty percent of contributions collected in Mississippi remain in the state. 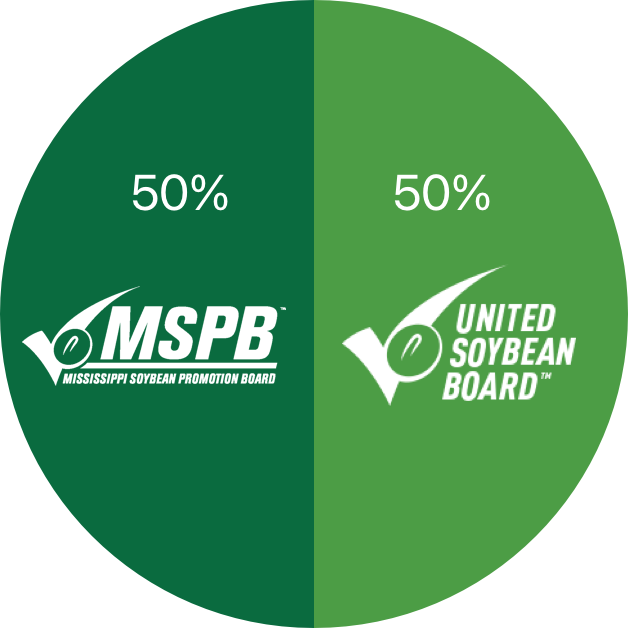 The Mississippi Soybean Promotion Board invests these funds in research, promotion and education to improve the profitability of soybean production on behalf of all Mississippi producers. The remaining 50 percent of funds are sent to the national soy checkoff, directed by the UNITED SOYBEAN BOARD. Composed of 69 volunteer farmer-leaders, USB invests soy checkoff funding to conduct research and drive demand for U.S. soybeans. Background: Mississippi soybean farmers face challenges that other states do not face, plus challenges that are shared with other Midsouth states. The Mississippi Delta produces some of the highest quality soybeans in the United States, but the state’s producers face unique challenges such as the threat of beans rotting in the pod at the end of the season. Approximately 90% of the soybeans grown in Mississippi are exported and there are no processing plants in the state. Due to such limited domestic use of Mississippi beans, it is likely that the state’s farmers would receive only minimal impact in their bottom lines by MSPB investment in activities such as promoting biodiesel, supporting animal agriculture growth, and investing in research and activities that support soybean production for direct human consumption and organic systems. With strong international demand for the high-quality soybeans produced in Mississippi, there seems to be little or no need to market Mississippi soy internationally. Therefore, the MSPB should focus investments on production research that will provide the greatest impact to Mississippi soybean farmers’ bottom lines. This includes strategically investing in research and transferring the results of that research to farmers to implement in their own operations. This is especially important as public funds to support production research continue to decline. Core Value: The Board, with honesty and integrity, collectively and individually, is committed to working within the letter and spirit of applicable law and regulation to achieve maximum value for each Mississippi soybean farmer’s checkoff dollar. Mission: Invest Mississippi checkoff dollars to develop and promote soybean and soybean production to improve the bottom line potential for soybean farmers. Strategy: Leverage funds and partner with public and private entities to address production research, identify market opportunities and communicate the outcomes to Mississippi soybean farmers. • Initiate, focus and collaborate on research to strategically invest resources in priority areas impacting Mississippi soy. • Develop genotypes that address biotic and abiotic stresses, and that contain functional traits unique to Midsouth soybean production. • Maximize adoption of desired genotypes unique to the Midsouth by Mississippi soybean producers and their advisors. • Pursue regional marketing opportunities for Mississippi soy. • Identify and promote technology and data services to support Mississippi soy production.